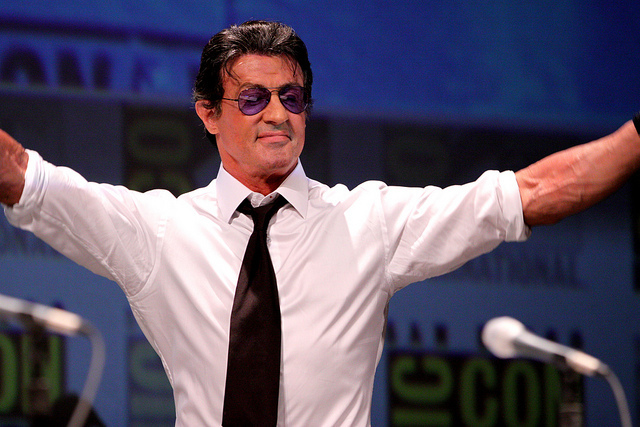 “Sly”’s story is a classic American rags to riches story. He was born Sylvester Gardenzio Stallone in New York, NY on July 6, 1946. Complications from misuse of forceps used during his birth severed a nerve, causing paralysis in the lower left side of his face, lip tongue, and chin. This would give Stallone the trademark Rocky Balboa snarl. On March 24, 1975 with poor and desperate to support his family, he was inspired to write what would be the script for Rocky in three days and 22 hours. Unable to sell the movie rights at first, he was forced to sell his beloved dog for cash. Stallone’s insistence that he be cast for the leading role made selling the script even harder. When finally reaching the deal that would allow him to star if the budget were significantly reduced, Stallone bought back his dog, which ended up starring in the film. Rocky went on to be nominated for ten Academy awards, including Best Actor and Best Original Screenplay nominations for Stallone. It won the Academy Awards for Best Picture and Best Film Editing. In addition to becoming a successful screenwriter and actor, he has succeeded in becoming an accomplished producer and director with a reported net worth of $400 Million today. With all these blessings, what more is necessary to make us a happy and prosperous people? Still one thing more, fellow citizens – a wise and frugal government, which shall restrain men from injuring one another, which shall leave them otherwise free to regulate their own pursuits of industry and improvement, and shall not take from the mouth of labor the bread it had earned.